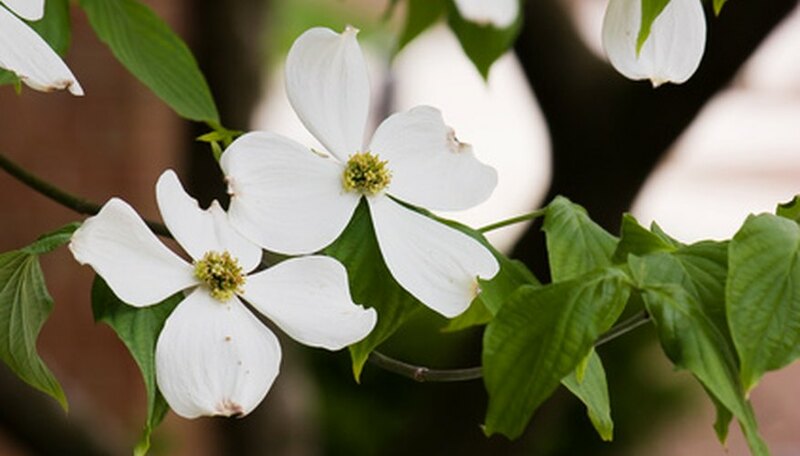 The flowering dogwood, the state tree of Virginia, grows in the wild mainly in the eastern half of the United States. The dogwood can be either a multi-trunk or single trunk tree. The flowering dogwood tree, an understory tree in nature, grows underneath larger and bigger trees. Cultivars of flowering dogwood differ in their flowers, foliage and growth habit. The height of this deciduous tree can be from 15 to 30 feet, with a width from 15 to 35 feet. The average size is 15 feet in height and 15 to 20 feet in width. Trunk size tends to be short and either single or multi-stemmed, and the shape of the crown of the tree is round. Layered horizontal branches spread outward, making the spread of the tree larger than it is tall. The gray bark of the flowering dogwood tree features a pattern of small rectangles. The green leaves of the dogwood grow 3 to 6 inches long and turn red and purple in the autumn. Flowers appear in the spring just as the leaves are beginning to appear. Each flower has four petal-like bracts, white or pink in color, that encircle the tiny yellow flowers. The obovate shaped bracts grow to be 3 to 4 inches long. Blossoms remain on the tree for anywhere from two to three weeks. After flowering, the dogwood produces red football-shaped fruit ½-inch long. The fruit generally stays on the tree into the winter season. Close to 100 different cultivars of the flowering dogwood tree exist. These cultivars can be divided into four groups: trees that have large flowers, such as Barton, Cloud 9 and Junior Miss; those with pink or red flowers, such as Cherokee Chief, Cherokee Sunset and Red Beauty; variegated foliage varieties, including Cherokee Daybreak and First Lad; and dogwoods with an unusual growth habit, including Compacta, a slow-growing form, Pendula, a weeping dogwood and Pygmaea, a dwarf plant. Scientists at Rutgers University began hybridizing the flowering dogwood to develop a cultivar resistant to anthracnose and the dogwood borer. The Rutgers Stellar series was the outcome of their research and hybridization. Aurora Dogwood, Constellation Dogwood and Ruth Ellen Dogwood are a few of the cultivars in the Rutgers Stellar series. Flowering dogwood trees adapt to many different habitats within its growing region. It is usually found in habitats that provide fertile, moist, well-drained soil. The flowering dogwood is an important understory element in both hardwood forests as well as on the perimeter of pine forests. Its native habitat ranges from Massachusetts to Florida, west to Texas, Mexico and Ontario.